LACOSTE, LOUIS, notary and politician; b. 3 April 1798 at Boucherville, L.C., son of Louis Lacoste and Joséphine Dubois; d. 26 Nov. 1878 at Boucherville, Que. A descendant of Alexandre Lacoste, who came originally from the Department of Gard (France), Louis Lacoste received his secondary education at the college of Montreal, then studied law, and on 19 March 1821 was commissioned as a notary. He practised at Boucherville. In 1834 he decided to launch out into politics. 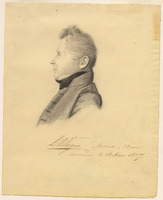 He was chosen as member for Chambly County in the House of Assembly of Lower Canada, a position he kept until the constitution was suspended in 1838. 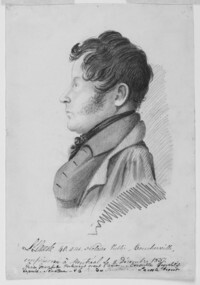 He was an ardent supporter of Louis-Joseph Papineau, and on 23 Oct. 1837 took part in the assembly of the six counties held at Saint-Charles-sur-Richelieu. He delivered a violent speech there, and even proposed a resolution in which was stressed the urgency of replacing officers who had been appointed by an “administration hostile to the country” by trustworthy men. Therefore “all the parishes of the six counties are simultaneously invited, between the first of December and the first of January following, to elect justices of the peace, arbitrators, and officers of the militia.” It was not long before this unequivocal commitment in the fight against the government brought reprisals upon him: on 8 Dec. 1837 a warrant of arrest was issued against him. He gave himself up to the sheriff, was put in prison in Montreal, and was not freed until 7 July 1838, on bail of £1,000. Once the storm was over, Louis Lacoste returned to his profession, of which he was one of the most brilliant representatives. On 23 Oct. 1843 he was again elected mla for Chambly, and remained its member until 6 Dec. 1847 (Ægidius Fauteux* states, however, in his work Patriotes de 1837–1838 that Lacoste did not return to public life until 1849). He again represented the same county from 25 Sept. 1849 to 23 June 1854. 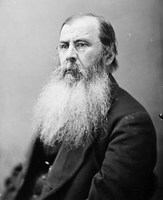 After an absence of four years, he returned to parliament for the period 1858 to 1861. 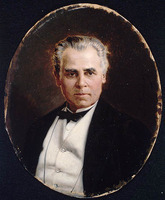 With George-Étienne Cartier, Joseph-Édouard Cauchon*, and Joseph-Édouard Turcotte*, he was one of the last of the members who had been elected to the first parliaments of the Union. These liberals had evolved under Cartier’s leadership, and around 1856 they were referred to as the Bleus, by contrast with the Rouges, or radical liberals. 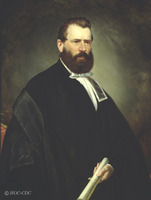 When the Legislative Council became elective, Louis Lacoste resigned as a member of the assembly and was elected legislative councillor for the division of Montarville, a post he held until confederation. 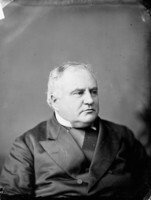 In 1867 he was appointed a senator, and remained in the Senate until his death. 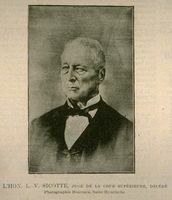 Louis Lacoste was called upon to play an important role in the field of education. On 22 Feb. 1853 the government set up a select committee “to inquire into the state of education in Lower Canada.” This committee was presided over by Louis-Victor Sicotte*, mla for Saint-Hyacinthe; Lewis Thomas Drummond*, William Badgley*, Cartier, Antoine Polette*, Louis Lacoste, John Sewell Sanborn, Jean-Charles Chapais*, and Robert Christie* were assigned to assist him. The inquiry was made necessary by the sharp criticisms levelled against the school system in Lower Canada and by the friction which disturbed Dr Jean-Baptiste Meilleur’s administration. The committee prepared a questionnaire which was addressed to all the parish priests or Protestant ministers, and to the secretary-treasurers of the municipalities. More than 400 persons replied, in particular Jacques Crémazie, lawyer and member of the Quebec Board of Examiners. 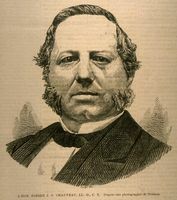 The report of the inquiry had no immediate results: the principal consequence of the recommendations of the Sicotte commission was Dr Meilleur’s resignation on 19 June 1855, and his replacement by Pierre-Joseph-Olivier Chauveau*, who thus became the second superintendent of education in Lower Canada. In the following year two important school laws were passed by the parliament of Canada, with Lower Canada expressly in mind: these laws set up a Council of Public Instruction, a Journal de l’Instruction publique (in both languages), and three normal schools. They were the logical outcome of the work of the Sicotte commission. On 14 July 1823 Louis Lacoste had married Catherine-Renée Boucher de La Bruère, who died on 23 Aug. 1832. One son, Louis-René*, was born of this marriage. A notary, he died at the age of 31, when he was showing great promise. On 28 Sept. 1836 Louis Lacoste married Charlotte Magenty Mount, but soon afterwards became a widower a second time. He took as his third wife Marie-Antoinette-Thaïs Proulx, on 17 Nov. 1838. Of this third marriage Alexandre Lacoste*, a chief justice of the province of Quebec, was born. JALPC, 1852–1853, app. J.J., “Rapport du comité spécial de l’Assemblée législative nommé pour s’enquérir de l’état de l’éducation et du fonctionnement de la loi des écoles dans le Bas-Canada.” Dom. ann. reg., 1878. Le Jeune, Dictionnaire, II, 21–22. Political appointments, 1841–1865 (J.-O. Coté). P.-G. Roy, Les juges de la province de Québec, 283. Turcotte, Conseil législatif de Québec, 249. L.-P. Audet, Histoire du conseil de l’Instruction publique, 15–24. Dent, Last forty years. Fauteux, Patriotes, 280–81. Louis Lalande, Une vieille seigneurie Boucherville; chroniques, portraits et souvenirs (Montreal, 1890), 211–20. J.-E. Roy, Histoire du notariat, III. J.-J. Lefebvre, “Les députés de Chambly, 1792–1967,” BRH, LXX (1968), 16–18. Louis-Philippe Audet, “LACOSTE, LOUIS,” in Dictionary of Canadian Biography, vol. 10, University of Toronto/Université Laval, 2003–, accessed April 21, 2019, http://www.biographi.ca/en/bio/lacoste_louis_10E.html.